In the upcoming years, e-commerce is expected to boom in the Asian region. The number of digital buyers in Asia Pacific is projected to pass the one billion mark for the first time in 2018, which will account for 60 percent of all internet users in the region. In line with the regional growth, India, a fast-growing emerging Asian market, shows optimistic projections for the e-commerce industry. Current active e-commerce penetration in India stands only 28 percent, with lots of room for improvement - India's retail e-commerce CAGR is projected to reach 23 percent from 2016 to 2021. Close to 329.1 million people are projected to buy goods and services online in India by 2020. This means that about 70.7 percent of internet users in India will have purchased products online by then. The majority of digital shoppers in India are male. This growth in volume of digital buyers has a reflection on revenue as well. Retail e-commerce sales in India are forecast to grow tremendously, with projections to jump from around 16 billion U.S. dollars in 2016 to just over 45 billion U.S. dollars in 2021. 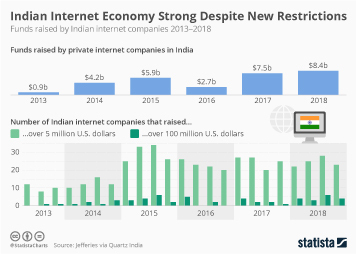 In 2016, Amazon.in was the leading online store in India with net e-commerce sales of 437.7 billion U.S. dollars, followed by local competitors Flipcart and Snapdeal. Mobile is also a profitable and promising shopping platform for the retail industry in India. In fact, about 23 percent of Indian internet users stated that they used a mobile phone for making a purchase in 2016. This places India as one of the leading digital markets for mobile e-commerce penetration. About 27 percent of digital buyers in the country stated making an online purchase via their smartphones/mobile on a monthly basis, and 24 percent stated purchasing online goods and services weekly. About 71 percent of consumers in India also said mobile wallet is their preferred method of digital payment. In terms of value, sales from mobile retail e-commerce are projected to generate 63.5 billion U.S. dollars in revenue by 2020.